What can go wrong doing lateral raises for your middle delts? Plenty. Here are the top 7 blunders. When you were younger, you probably had a wish list for Santa. Now that you're a big boy, I bet that list includes new things like bigger pecs, an inch on your arms, or wider shoulder caps. Bigger delts are high on every trainer's list because they create the illusion of a smaller waist, improve the visual delineation from the upper arm, and add the kind of cap that says you're a serious lifter. That little extra stretch in your shirts? That's what I'm talking about! Like a lot of lifters, you might be starting your shoulder workout with overhead presses. That works. But adding lateral-raise movements is the best way to isolate the middle delts in the lateral (side) plane. The lateral raise is popular. So is blowing the technique, often in more ways than one. Here are seven ways to screw up the most common variation, the standing dumbbell lateral raise. To do a lateral raise correctly, you create a very slight bend in your elbows, then maintain that same degree of bend throughout the set. The angle in your elbows at both the bottom of the rep should be the same it is at the top. If you start opening and closing at the elbows, you're bringing the triceps into the equation, undermining the middle-delt isolation you're trying to achieve. Ideally, as you raise the weights, they should follow more of an arc than a straight line. Watch yourself, or have someone watch you as you do this move; this blunder isn't hard to correct if you're paying attention. The best way to build these target muscles is to maintain tension on the middle delt throughout each rep. 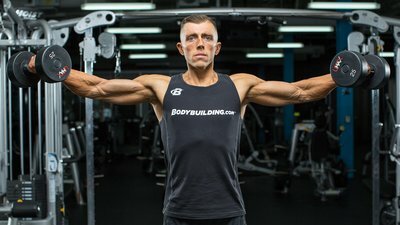 If you bring your hand all the way down so that it's hanging by your side or in front of your thigh, you're not putting any tension on your delt at all. What's more, when you start lifting from this fully extended position, the supraspinatus (a rotator-cuff muscle) initiates the movement before the middle delt head kicks in. That means the first few degrees of your lift aren't working your target muscles. Your best bet is to stop the movement with your hand several inches from your side. This will make lifting the weight back up a little harder, which is what you want, right? If you do want to work your supraspinatus a bit, then go ahead and lower the weight all the way. But when you lift it again, be careful not to use too much weight or make jerky motions, both of which can lead to injury. A common mistake among beginners is to wave the weights up and down without raising their elbows out to their sides. In that sense, the upper arms don't go through much of a range of motion, which can kill your middle-delt gains. That's why you always want to "lead with your elbows" so they go through the full ROM. When your elbows don't move much, you essentially negate the benefits of this middle-delt movement. Even though your hand is where it should be at the top, your elbows are still only about halfway up. Note to self: Always lead with your elbows. When you extend your range of motion above your shoulders, you'll probably have to back off on weight. You might consider a few heavier sets to shoulder level, followed by a few more with a slightly lighter weight taken about 45 degrees above parallel. If you have shoulder impingement or pain, it's probably not a good idea to lift above your shoulders. If this is an issue, talk with a sports-medicine doctor before trying to extend your ROM. Occasionally, you'll see someone doing lateral raises with their arms locked out to full extension. At the top of the movement, it looks like the person is trying to form the letter T. This full extension puts a heckuva lot of pressure on the elbow joints. Whatever exercise you're doing, it's never a good idea to lock out a joint. The "lever arm" concept in physics essentially means that the further away from your body a weight is, the harder that weight is to lift. Let's say you've been doing lateral raises with your arms almost fully extended and can lift 35 pounds. Then you start doing the raises with your arms bent at 90 degrees, and lo and behold, you can lift a lot more! If you think that extra weight means you're getting stronger, just try straightening your arms a bit more. Can you still do your reps with that weight? Probably not. That's the lever-arm law of physics hard at work. It's not unusual to hear people refer to their "medial" delts. There is no such thing. The correct word is "middle" delts. If you want to know the correct name—and want to sound like you know what you're talking about around the gym—stick to real names.